On Sunday afternoon, Feb. 10, 2019, the supermodel was spotted at the Wells Fargo Center in Philadelphia, Penn., where she cheered on her NBA star boyfriend, Ben Simmons, as he and the Philadelphia 76ers took on the Los Angeles Lakers for the second time this season, the New York Post reports. 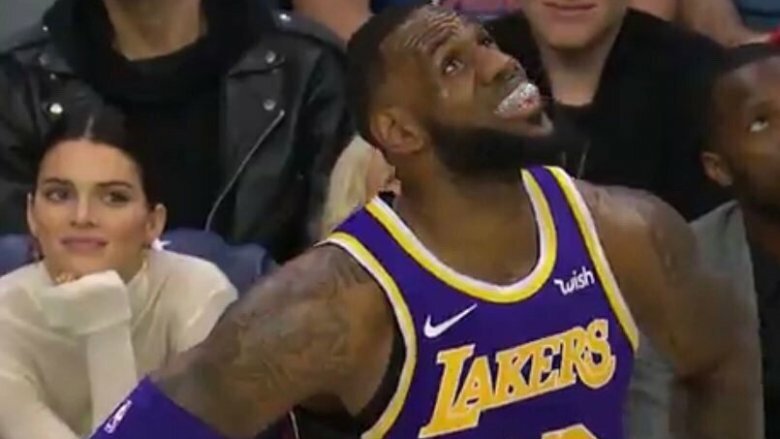 However, a number of viewers couldn't help but notice when Jenner appeared to stare at LA forward LeBron James from the stands in lieu of her very own beau, and it wasn't long before social media users reacted to the Keeping Up With the Kardashians star's reported faux pas. "Add Kendall Jenner to the list of women thirsty for LeBron," one person tweeted, while another wrote, "Find someone who looks at you the way Kendall Jenner looks at LeBron." Meanwhile, others took a moment to relate the Internet's latest talking point to Simmons' own performance during the game, particularly his news-worthy failed attempt at a rare 3-point shot. 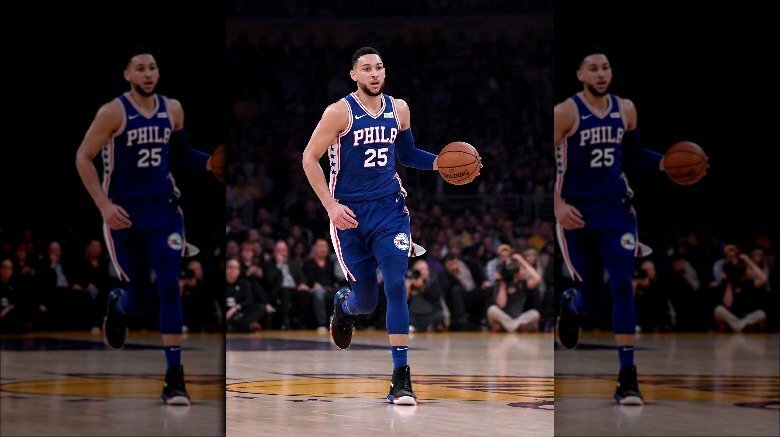 One Twitter user, who had captured a snapshot of the viral Jenner-James moment, wrote, "Ben Simmons saw Kendall Jenner looking at LeBron like this and decided to start shooting 3s oh my god." The 3-pointer in question, which took place shortly into the game's third quarter, seemed to come as a surprise to everyone but Simmons himself, who isn't necessarily known for his jump shot. After ESPN asked about the general reaction from the 76ers' bench, coach Brett Brown said, "A little bit like everybody's. Like, 'OK.'" Meanwhile, Simmons simply explained, "I might as well come down and pull it. I didn't really think about it." However, this seems to be a part of a new strategy cultivated by himself and Brown in order to help Simmons prepare for the playoffs. "I think just being more aggressive, taking more open shots and just trying to grow my game in that way," he said. "I think I'm getting there. It just takes time, but I'm going to get there." As noteworthy as Simmons' 3-point attempt, of course, was Philadelphia's 143-120 win over the Lakers. While the star point guard scored a total of 8 points, 34-year-old James, who signed a four-year $153.3 million contract with the Lakers last July, ended up with 18. Readers may recall that Kendall Jenner's latest celebrity romance began in May 2018. As Nicki Swift previously reported, Jenner, 23, and Simmons, 22, were first romantically linked after being spotted grabbing lunch together at the Beverly Hills Hotel. According to a source cited by Page Six at the time, the two had already been seeing each another "for a few weeks." Meanwhile, another insider claimed, "Security measures seemed to have been taken to ensure Kendall and Ben enjoyed their night hassle free. They were smiling the night away with their friends." While the E! star previously dated basketball star Blake Griffin (via People), Simmons had broken things off with singer Tinashe not long before this outing, according to Complex. Unfortunately, this allegedly murky relationship timeline quickly prompted cheating allegations against the basketball pro — at least from Tinashe's own brother, Kudzai Kachingwe. "Never met you before in my life. Days after u break my sis heart u do this," he wrote in a since-deleted tweet (via Page Six). He added, "No f**king excuse for cheating, be a man and figure it out." For her part, Jenner was later seen out and about with Anwar Hadid, the 19-year-old younger brother of models Gigi and Bella, over the next few months. According to TMZ, the two were allegedly spotted kissing and cuddling in June 2018, and later went out on what appeared to be a double date with Kourtney Kardashian and Grown-ish actor Luka Sabbat. After the duo stepped out together at New York Fashion Week that October, a source told People that they seemed "very much together." However, by the following month, Jenner and Simmons appeared to have reconciled their on-again, off-again relationship. At the time of this writing, neither Kendall Jenner nor Ben Simmons have publicly commented on that look she appeared to give LeBron James over the weekend. However, considering the fact that the reality TV star took two trips in a private helicopter to the City of Brotherly Love over the last week just to cheer on her NBA star boyfriend (via the Daily Mail), we're guessing she really only has eyes for her man.